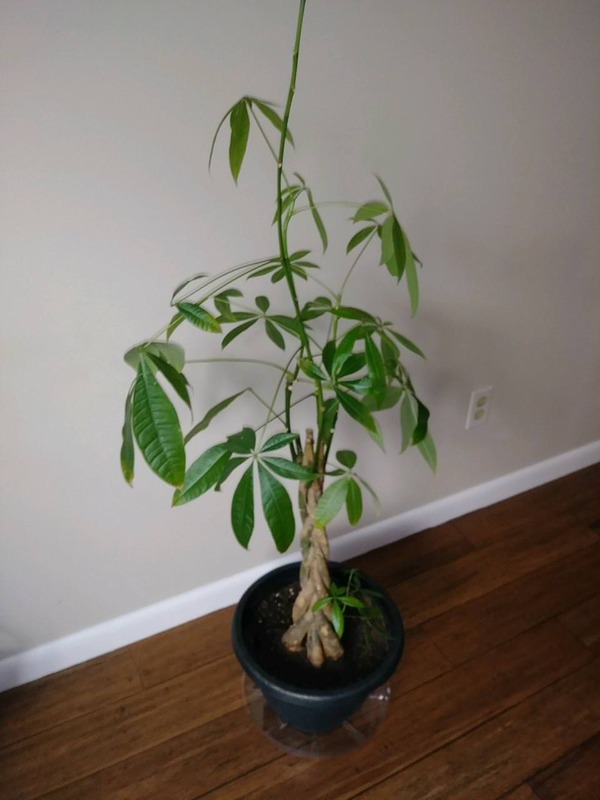 One of my friends sent me a picture of her money tree that looks stress due to low light but I'm not sure. Can anyone help me? As you may already know, the “Money Tree” is a versatile when it comes lighting needs. This plant grows in full to partial shade or even almost full shade outdoors. It can grow in bright but indirect light indoors. If you plant is growing is growing in a container outdoors, position it in a protected area out strong winds which can dry out the plant fast. If your “Money Tree” is in an outdoor container or indoor pot, turning the pot weekly can help keep the plant’s growth balanced. I would snip back stems just in front of a leaf node to remove length. Cut no more than 1/3 of a stem and snip it at a 45 degree angle to promote new growth. Cut out dead twigs to keep the money tree healthy and keep the tree from energy resources on a branch that is not going to spring back to life. Snip off back to the base of the plant, or 3 inches past the last dead portion of the twig if a significant amount of it is still alive. If cutting near the twisted main stem of the plant, cut 1 inch out from the trunk to prevent scarring. Trim back the top stems of the tree to prevent the money tree from growing taller, after it reaches the height you want. For indoor plants, keeping the money tree pruned low to the twisted trunk will help you control its size. Snip off new stems that form on the base trunk of the money tree plant if they are growing near the bottom of the twisted trunk. These need to be removed to keep the interesting trunk visible and stop the tree from putting energy into not needed growth. Remember, snip off close to but not flush with the trunk. Yes, as you guessed, the spindle-looking branches are due to the plant needing more light. An easy fix is to move the plant near a southern facing window. Lastly, it appears this plant could use a little fertilizer to green up the leaves.